What is the method to issue the One-Time Password & How long is its validity period? 1. Using the [OTP generating application]. It is possible to issue OTP by using [OTP generating application] installed on the smart device. This application generates a random value every 30 seconds. The way sending the OTP notification message to the specified mail address. Its validity period is 2 minutes and 30 seconds. For the above 2 patterns (1 and 2), the instruction guide is provided. 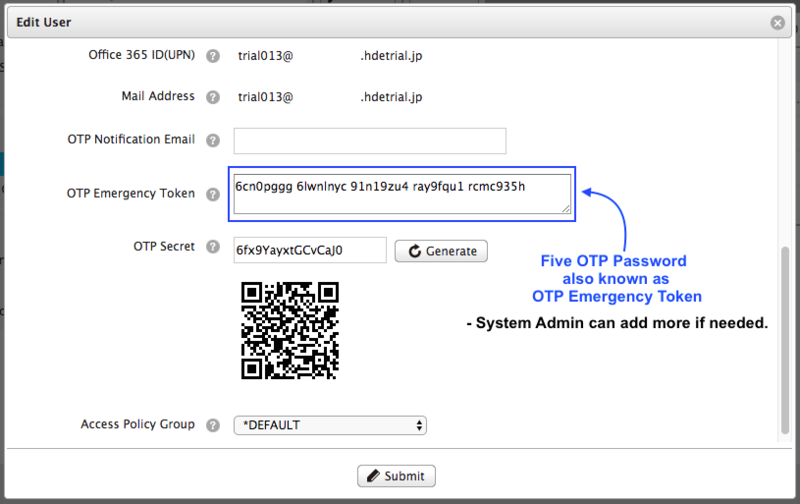 The way using the [urgency OTP token] (*) which is available only for the administrator to confirm/set up. This is just a [One Time (use) Password]. Once you use this OTP token, it becomes no longer available. Log in to the Access Control management page using administrator privilege. Click on the pencil icon (edit) of the user that you would like to do some setup and confirmation. * After used up the [urgency OTP Token], it is necessary for the administrator to redo the registration per each user through the user list page. In the default settings value, 5 users should have been already registered. In order to frequently use the [urgency OTP Token], it is possible to change this value to greater one than you expecting. This [urgency OTP Token] needs to be setup with the code consisting of more than 8 characters including more than one alphabetical characters.